Unlike gas water heaters, tankless water heaters or electric water heaters, a solar hot water heater uses the energy of the sun to heat water for your home. Years ago it was simple: Replace your hot water heater with one of the same. Today, however, there are many options to consider as most people are looking for energy efficiency or green hot water heaters for their home or business. Solar water heaters are by far the best choice if applicable. • Number of people living in your home (what is the demand). • How well will the unit hold up, is there plenty of direct sun light where you would place the solar panels. • Availability of parts and cost to repair the Solar water heater. • Estimated energy efficiency of various models. • Maintenance and repair information, some units can be maintained by the D.I.Y. person. • Cost of unit as it relates to annual operating cost. The sun is the oldest water heating system there is-and it's making a comeback. The U.S. Department of Energy estimates that more than 1.5 million U.S. homes and businesses heat their water with the sun-and more than 94% of them consider it a great investment .Approximately 14% of energy consumption is used to heat water. This energy comes from fossil fuels for the most part, a non-renewable resources. Solar water heaters = " No pollution / greenhouse gas emissions". • Free energy from the sun to supply you with endless hot water. • Lower utility bills, Gas or electric. 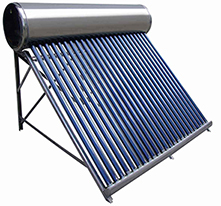 • Living in CITY, a solar water heater will work great. • federal and state tax incentives make these systems more affordable. • Tank-less water heaters save more space then any other water heater, compared to a solar water heater. • The cost up front for installation is often more unless you find a local incentive program. • You must endure the eyesore of panels on the roof, Some people find them visually unattractive. • You may need to cut or remove trees if the area is shaded. If you're considering installing a new solar water heater, We would highly recommend it over the standard tank type water heater. 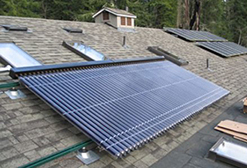 Solar water heating has become a topic of discussion in recent years, mostly due to concerns over rising energy costs and the general movement towards "green" energy applications. solar hot water heaters have been around since the 1970's. Unfortunately there were many ill-made and "fly-by-night" installers that left people with damaged houses, large debts, non-working devices and no hot water. That gave the entire industry a bad reputation. Today's units are safe, well made and efficient. The new solar hot water heaters last an average of 20 years. that's twice as long as standard tank type water heaters and can save more then half the money you would spend on standard unit. Consider installing a Hot Water recirculation pump with your new Solar water heater. Solar water heaters come in a couple different variations: Active and Passive. 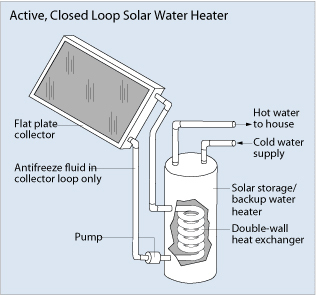 With an active solar water heater, a pump circulates either a refrigerant or water through the solar collector. This heats the water or refrigerant and then sends it back to the hot water tank where it is stored. 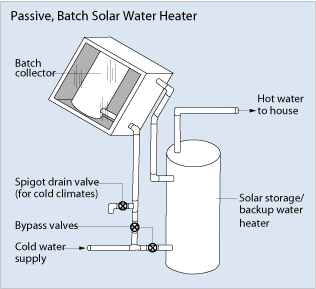 Passive solar water heaters don’t use pumps. Instead, hot and cold water is circulated through the collector using the process of convection which causes warm water to rise and cold water to sink. In cold climates, solar hot water heaters are often used to prime the cold water before it heads to the traditional tank hot water heater. However, in desert climates like in Arizona, solar hot water heater could potentially provide all of the hot water for your home.